Commercially available sunscreens are some of the most toxic products we could apply to our skin. Try this simple DIY method of making a natural alternative. 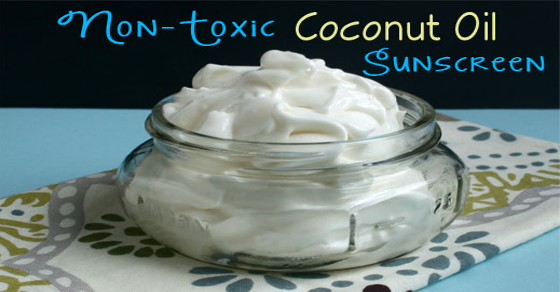 Many carrier oils used in holistic and natural skincare have an intrinsic natural SPF, or sun protection factor, and coconut oil is one of many carrier oils which can be used to make a sun protection cream. The SPF of a product measures the level of protection against the UVB rays from the sun, known as the burning rays. Typically SPF's range from a very low 1 to a very high 50. According to the book “Oils of Nature” by Anthony J. O'Lenick the oils with the highest natural SPF's alone are carrot oil which is graded as 38-40 and raspberry seed Oil at 28-50. Jojoba oil, sesame oil and coconut oil range from 4-10 so the oils alone will not offer enough protection. However, by adding zinc oxide you can produce more of a full spectrum sunscreen which will offer protection against UVA (the ageing rays) as well as UVB. Measuring the exact protection from homemade sunscreen is not precise so safe sun exposure should always be considered. With zinc oxide care should be taken to source high quality which is specifically formulated for the cosmetic industry, but it must be uncoated and not nano-particle grade. It is best to use a simple dust mask to avoid inhaling any of the zinc oxide dust. This mineral addition to the sunscreen will leave a white hue on the skin as it isn’t absorbed within the skin layers. The addition of beeswax will give it slight water repellant properties. The essential oils you add will be a matter of personal preference although in general citrus oils in particular should not be used as they are phototoxic meaning they will actually cause burning. Carrot seed essential oil has a natural woody, earthy scent. This is a rich body butter, so a little goes a long way. You should find all of these ingredients online or at your local health food store. Using a double boiler (or a small pan over very low heat), melt your coconut oil, sesame or jojoba oil, beeswax, and shea butter together. The beeswax will be the last to melt. When the beeswax is melted, remove the mixture from the heat and let cool to room temperature. If you're using zinc oxide, whisk it in at this point, being careful not to create a lot of dust. If there are some lumps, that's OK. They will break up when you whip the body butter in step 4. Take the mixture out of the fridge and using a stand mixer or hand mixer, start to whip it. Drizzle in the red raspberry seed oil, the carrot seed oil, and any essential oils of your choice, and continue whipping until the mixture is light and fluffy.